September / October is dead centre of the typhoon season in Japan. The storms do come at different times in the year but if you were to organise a major sporting event with one hundred and fifty thousand spectators you'd be hard pushed to find a more unreliable time. Obviously the Olympics are scheduled for September but that it many years away but today is the Japanese Formula 1 Grand Prix. And typhoon Phanfone will make landfall a little further south at about the same time the drivers start their engines. The Japanese Grand Prix is not unused to heavy rain. In 2007 the heavens opened and the first nineteen laps were a slow procession behind the safety car as I sat freezing in the stands. It was eventually won by Hamilton with his race engineer commenting "I guess we can tick off racing in the wet then". 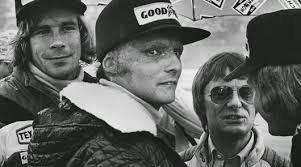 In Ron Howard's superb dramatisation of the 1976 Grand Prix season, Rush, you experience what it was like for the drivers in extreme conditions. And of course James Hunt winning the World Championship. The Japan race has historically been a pivotal one in the F1 calendar being so late in the season with thirteen champions being crowned here over the years. However with the increase in dates this won't be the case this year and with four races still to be held following Japan it's unlikely to be again in the future. The wets will be on every car today, each moving sixty litres of water a second which is the equivalent of over five tons per second on the grid. 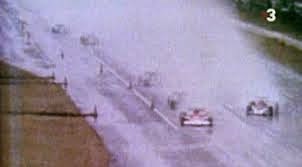 Have a great Japanese Grand Prix, I hope you have an umbrella.